PT Putragaya Wahana (PGW) announced the acquisition of 180 units of apartments by UOL Group Limited, valued at 56.8 million US dollars or equivalent to Rp 816 billion. INDUSTRY.co.id - Jakarta -PT Putragaya Wahana (PGW) announced the acquisition of 180 units of apartments by UOL Group Limited, worth 56.8 million US dollars or equivalent to Rp 816 billion. This apartment will be named Parkroyal Serviced Suites. 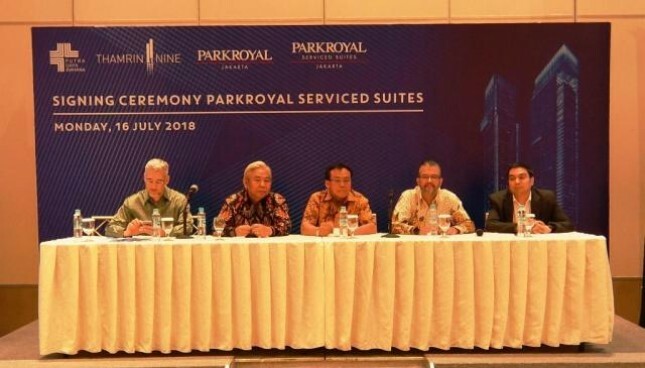 In addition, PGW also announced the signing of a management agreement for the operation of 200 units of Parkroyal Hotel in Tower 2 of the Trinrin Nine complex, which has been signed with Pan Pacific Hotels Group Limited (PPHG). Located in Central Jakarta, Thamrin Nine is a 5.4 hectare mixed-use concept building located along MH Thamrin Street, Central Jakarta, a prestigious area in Indonesia's golden triangle. In a press conference held in Jakarta on Tuesday (17/7) Commissioner of PT Putragaya Wahana, Indrajati Sidi revealed that this complex will be connected directly to Dukuh Atas Subway Station via underground tunnel. New Sudirman Station with train service to and from Soekarno-Hatta Airport is also within walking distance. "With the gradual development, Tower 2 is expected to be completed by 2022," explained Indrajati Sidi. The Tarmrin Nine is designed by internationally recognized Kohn Pedersen Fox Associates from New York. The mixed-use concept building Thamrin Nine is strategically located in Thamrin, Jakarta's most prestigious business district, with a total floor area of ​​approximately 470,000 sqm. Design Director of PT Putragaya Wahana, Michael Winner added, Tower 1 and 2 are office-class areas with premium A class which also has facilities such as podium retail, commercial facilities, sports centers, entertainment facilities and luxury hotels and high-end business hotels. This makes Thamrin Nine an ideal integrated city building. "Tower 1 of Thamrin Nine will be the tallest building in Indonesia and the 96th highest in the world, designed with seismic safety and standards 25% higher than current building codes," he explained. In addition, Thamrin Nine has also been selected as Best Green Office 2016 at the Indonesian Property Awards.